Yep. Lickety split. We're home. 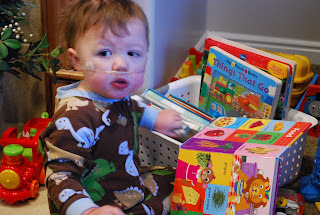 McKay is doing well tonight and we're gladly resting at home because they didn't really find much to do once they launched their little pleasure cruise inside his little circulatory system today. Unfortunately, the cath wasn't able to tell us much about what's going wrong. On the bright side, it did show how much is going right. Dr. Gray called McKay "The poster child for the Glenn" operation. This means perfect pressures. Impeccable valves. Gorgeous pulmonary arteries. And no collaterals to speak of. Hmmm. Then why the ever-devolving crappy sats? While we discussed many theories today, it's likely we won't know what's going wrong until a surgeon actually gets a good look at him. In other words, they'd have to open him up to know any more than they know now. And while we still need to have a good chit-chat with our cardio angel, that likely means there will be no putting off the Fontan. Little man needs some intervention fairly soon and they've done all they can do short of operating at this point. I'll post some great pics of Mac's anatomy once I have a chance to scan them in tomorrow. I just fell down the stairs on my way to grab this computer. I'm going to take that as a sign that sleep is required--and soon. 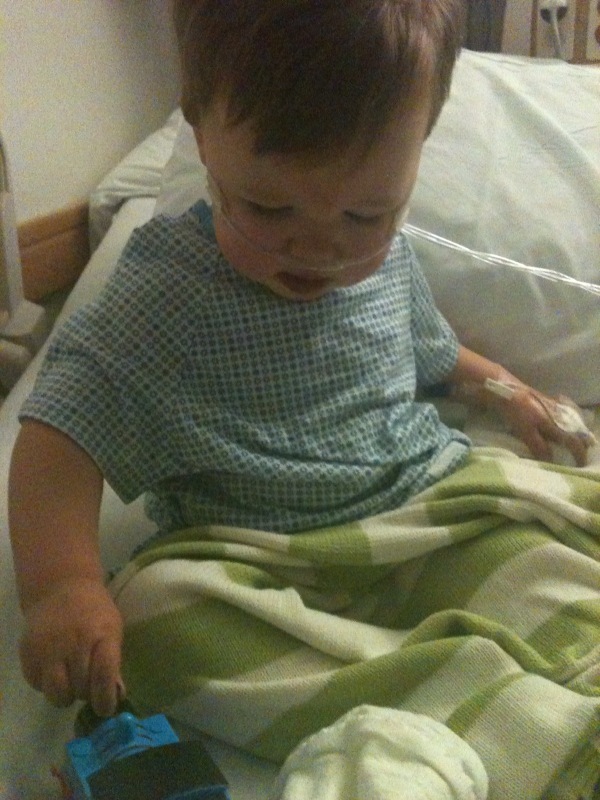 Until then, enjoy the pics of my cherub in recovery this afternoon. What mother of three busy boys gets five uninterrupted hours of cuddling? Today, I did. Praise be. Mr. Mac was a very good boy this morning. Oddly better than I expected for an exam and procedure scheduled hours away from when breakfast should have been and smack dab in the middle of nap time. Mind you he was not perfect, but he was cranky only when provoked (or poked) and Leo, June, Quincy and Annie instantly calmed him. They expect the procedure to last about three hours. We'll try our best to keep you posted. 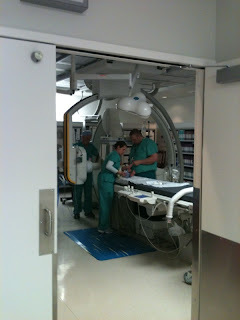 Here is an inside view of the cath lab. Such a big room for such a little guy. If you look hard you can see his tiny toes. I must say walking away is not getting any easier. It's been a long while between posts. And a very long while since a really honest-to-goodness- this-is-how-it-is post. Today, I think I'm finally ready to record some truth. The truth is that the last several weeks have been lived in a bit of a haze. Huge personal victories have been recorded. I finished the Boston Marathon. I accepted a dream position at work. I have wonderful kids who are accomplishing really extraordinary things. And all the while I have been living this blessed life from a distance. Sure, I laughed when things were funny. I shared honest thoughts and points of view when asked. But it's as if I've been hovering just above myself these past few weeks. Observing. Recording. But not really living the moment. I didn't realize the depth of the cocoon I'd built for myself until I attended an exceptional luncheon yesterday. 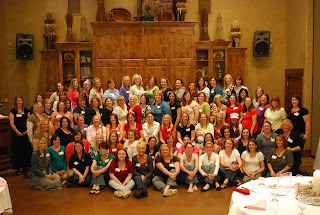 Put together by an amazing non-profit, Intermountain Healing Hearts, the gathering was focused on honoring "heart moms." A few of the Heart Moms of IHH celebrating our kids and sharing our lives. It should be noted here that I was reluctant to join a group with a label such as this immediately after McKay was born. Me? Be part of them? Surely my baby was different. Surely we would not be regulars at the hospital the way these mothers were. Knowing all the nurses. Giving directions to other families who were clearly lost in the hallways. Nope. The thought of it seemed absurd. But then it got pretty lonely pretty quickly. It wasn't that I didn't have amazing friends and family. It's just that I didn't have anyone who just knew. Who just knew how crappy it felt to have to force meds into tiny, pursed lips. 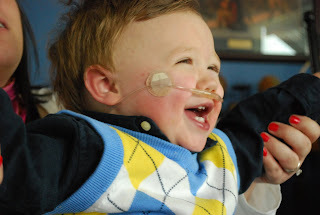 Who had lived through weeks of sleepless nights worried about oxygen tubes and feeding tubes wrapping their way around little limbs and necks. Who took a deep breath every morning while still lying in bed trying to muster the courage to see if your baby made it through the night. Who knew the isolation of closing off the world every November knowing you could not emerge as a complete family again until the next spring. You know, people who just know. So just a few months after McKay's Glenn operation, I reached out and felt comforted by the sisterhood of IHH. It was at this amazing luncheon yesterday, listening to the speakers, taking in the music, that I realized I have been numb for a while now. I have chalked up my lack of blogging, lack of keeping a careful record of the past few months, to time. I was busy. But as I began to feel my guard lowered in the conversation and hugs of yesterday afternoon I realized that we all have the same 24 hours we've always had. I was choosing not to feel things in my life. I was not strong, I was absent. 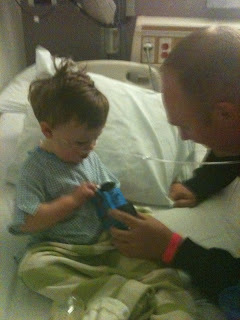 McKay will have a heart cath tomorrow morning. He's been slipping. He's blue. Some days, really blue. Sometimes we have to get him into the shower and warm him up with hot water and aggressive massage. He's not fine. Sure he's tough. And he's happy. But he's not fine. He wants to run and chase and be with his brothers. It's a scene that makes you smile so hard as a mother you think your heart will burst. And it lasts all of about 10 minutes. Then McKay drops to his knees. Struggles to keep playing. Then he gives you that look--I'm tired, mom. And the magic evaporates. Instead of realizing the situation for what it is, instead of feeling my way through all of the emotions, I've tried to control it. "How's McKay?" "He's fine." I've even confessed to Matt that sometimes I feel like I need to distance myself from our little Macaroon. Maybe if I tried, I could stop loving him so much. I could give him just enough love to thrive, but not enough to hurt me so much on the bad days. That's an ugly confession. But it's real. Your mind tries to save your heart in strange ways when things aren't perfect. Fortunately, it's impossible not to love your children irrationally and uncontrollably; especially when they need you most. So I sobbed yesterday. In public. Among other mothers who didn't ask why. And then I got angry. I was angry with myself for allowing my heart to withdraw to safe places where no real living goes on at all. Life is here. I have one shot at getting it right. And I want to feel every inch of all it has to offer. So tomorrow is going to be hard. I know that. They have asked to keep McKay overnight this time. That's new. They've never planned to have him stay. Maybe it's that he's more unstable now? Maybe it's that they expect to find a lot wrong? And maybe it's just that he's so stinkin' cute they want to bask in his smile a while longer. Yep, that's probably it. The doctors try to shelter you sometimes from their own concerns--funny, because it only makes you worry more. So we'll make it through starving McKay through the night and until 11 tomorrow morning. And we'll ask a hundred questions and remember one or two answers. That's just how these things go. I'll probably eat too much and run at irrational times of the day this week. I'll likely snap at Matt and pack the diaper bag full of things I know we won't need. That's just how these things go. But mostly, I will try to be in the moment, not merely observing it. I will try to be with my child, not just standing next to him. Because if I choose to shut it off, to protect myself, McKay might as well be with anyone else in the world at that point. And we all know little boys need their mommas. Tomorrow I will be his. Reader's corner. McKay loves books. And I love that! Please say a little prayer for our big guy. He will be brave. The doctors will be expert. And all will be well. But just the same, we'd love to have your strength in his corner. We had our last visit with your painful magic yesterday (now a week ago). It was bittersweet. The doctor says he’s certain the insurance company will not approve another season for us under your protection. They tried to keep us away this year. But we fought. We were approved. 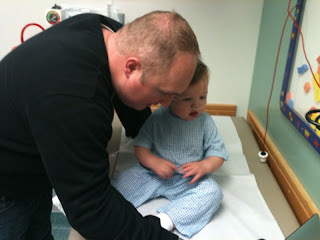 And the RSV came. I’m convinced you save Mac’s life. No, there will be no more. 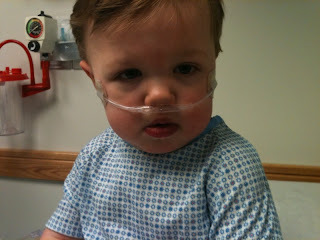 They say by the age of two McKay will be strong enough, big enough, to fight RSV all on his own. It’s a gamble they play between the cost of the shot, the odds of him getting sick, and the time it would take him to heal in the hospital if it got to that point. Let the cheapest outcome win. So here we go. Growing up bit by bit. Becoming more confident in our judgment. More confident in our little man’s ability to hold his own. More aware that the rationing, the committees of people who qualify and disqualify patients for care, and the casualties of those decisions are real. They exist. They’ve always existed. Knowing that the people who deal in fear mongering, half truth, and rumor do so to distract our eyes from how broken and inequitable the system they’ve created has become. We feel so blessed to be surrounded by advocates who know how to navigate your twisted paths. Who slay the dragons that block our way and lead us back to safe havens. So good bye Synagis. You’ve been a $30,000+ comfort. Overpriced and worth every penny. We’ve hated you. We’ve loved you. We’ve needed you. We will miss you.